Chef Willi Franz helps Brooke Brunning and Jaxon Dollam whip up a tasty compote. Turning kids into the next generation of 'foodies,' the Chefs in the Classroom program gets kids stirring in Kelowna. Teacher Leanne Reid’s Grade 3 Glenrosa Elementary school classroom was filled last Monday with the sweet smells of vanilla, cinnamon and fruit. The appealing blend came courtesy of a compote being heated up in a pot set in the corner of the classroom. There, students wearing paper chef hats they decorated themselves, took turns chopping fruit, stirring the pot and sharing cooking anecdotes from their kitchens at home. “I cut up vegetables at home all the time,” said Brooke Brunning, 9. Across the room, her classmate Keenan Haring, 9, pointed out that he has taught his mom how to make a tomato salad he first sampled in the class, and that he has a vibrant garden he works on. Several others chimed in about the veggies and fruit they too grow, and what tastes best. Foodieism and all it entails may not be a part of the traditional curriculum, but this year the Chefs in the Classroom program has ensured that it’s the most well loved. “It’s been great,” said Reid, as chefs prepared her class for the last of the eight-installment program on Monday. 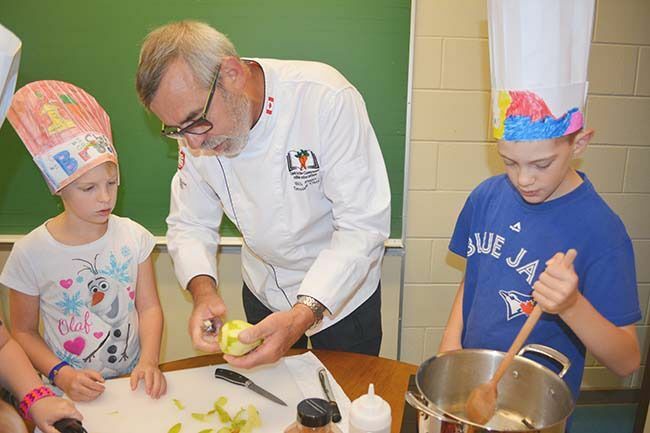 That latter connection to food production is one of the things that Willi Franz, a retired chef who now volunteers with the Okanagan Chefs Association, wants to impart to young people. “We want kids to know that food doesn’t come from a bag or that chicken doesn’t just come from a freezer,” he said. Franz said that, while Chefs in the Classroom is in its first year, there was a program in Vancouver that had local chefs teaching students in the three previous years. The newness of the Okanagan-centric program is being tweaked and altered, which, for example, meant Monday’s lesson was out of place. The class was supposed to eat something prepared from the vegetables they were growing, but a warm spring meant that the harvest-related lesson had to happen earlier than anticipated. “These changes will happen,” said Franz, noting that it is his hope that the program will expand in years to come and those involved will have more time to refine the curriculum. Thus far, the program has been rolled out in six schools with 35 volunteers making sure it happen. Those volunteers are chefs, junior chefs and others involved in the industry.